Induced by TNF, IL1A/interleukin-1 alpha and IFNG/IFN-gamma. Small volumes of anti-CCL11 antibody vial(s) may occasionally become entrapped in the seal of the product vial during shipment and storage. If necessary, briefly centrifuge the vial on a tabletop centrifuge to dislodge any liquid in the container`s cap. Certain products may require to ship with dry ice and additional dry ice fee may apply. Function: In response to the presence of allergens, this protein directly promotes the accumulation of eosinophils, a prominent feature of allergic inflammatory reactions. Binds to CCR3. Post-translational Modifications: O-linked glycan consists of a Gal-GalNAc disaccharide which is modified with up to 2 sialic acid residues. Similarity: Belongs to the intercrine beta (chemokine CC) family. 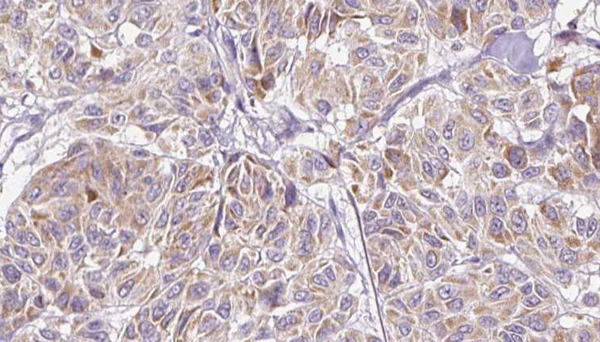 MBS9608810 at 1/100 staining Human Melanoma tissue by IHC-P. The sample was formaldehyde fixed and a heat mediated antigen retrieval step in citrate buffer was performed. 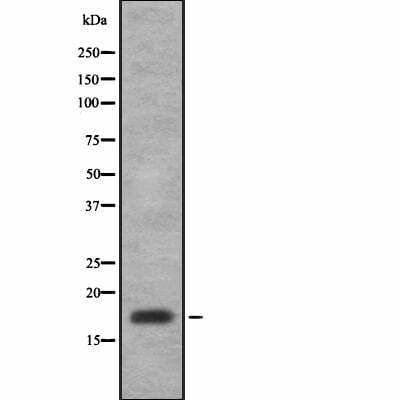 The sample was then blocked and incubated with the antibody for 1.5 hours at 22 degree C. An HRP conjugated goat anti-rabbit antibody was used as the secondary. NCBI/Uniprot data below describe general gene information for CCL11. It may not necessarily be applicable to this product.